Summer is a busy time for both honey bees and their keepers. Students in the Oregon Master Beekeeper Program are diligently working away at their requirements for certification, and we are already beginning to look ahead to the Apprentice class of 2018. Are you curious about bees and how to keep them? Are you interested in learning how to become a better beekeeper? Do you want to help others learn about bees? 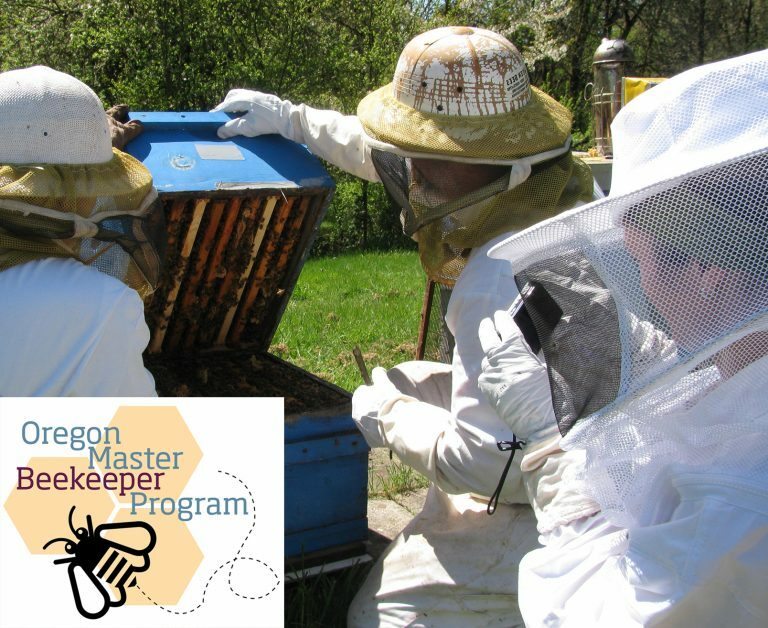 The Oregon Master Beekeeper Program is for you! The Oregon Master Beekeeper Program represents a collaborative effort between the Oregon State University Extension Service and the Oregon State Beekeepers Association. Participating beekeepers gain experience at three successive levels: Apprentice, Journey, and Master. Each level provides opportunities and support for additional learning, practice in the field, and community service. The Apprentice level emphasizes hands-on training with a mentor. Classroom-based and online instruction is available throughout the state. Completion of this level gives participants a solid foundation in beekeeping. The Journey and Master levels offer additional training in advanced beekeeping topics such as queen rearing and integrated pest management. These levels also involve bee-related research projects and community service to educate others about honey bees and beekeeping. Many educational opportunities are available to students enrolled in the program including access to web classes and several annual events held at the Oak Creek Center for Urban Horticulture on the OSU Campus. Meet other beekeepers from Oregon, improve your beekeeping skills, and learn something new! The deadline for the 2018 Apprentice Waiting List is Friday August 18th, 2017. Click here to add your name to the waiting list. The number of available students we are able to accept into the program is based on the number of available mentors we have in the program. Interested in the program? Contact us for more information!